Hi everyone. 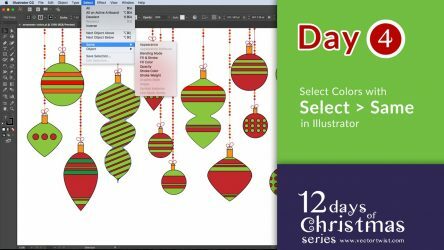 It’s Day 4 of Vectortwist’s 12 Days of Christmas series. Today I’ll show you how to select similar objects really fast. If you worked with complicated artwork in Adobe Illustrator, you’ve without a doubt come across the task of having to select tons of shapes that have similar attributes, like same color fills or strokes, stoke weights, styles etc. No worries though, Illustrator has the tools that can make changing colors or attributes so much easier. Let me show you how.